Normally you use a fancy box which allows you to show the description, thumbnail image, title, download count and download button. However, in some cases you may wish to show only specific aspects of a download item. In this tutorial I will explain how to do that. This can be useful if you want to show the downoad item using your own design. You use the shortcode to output the info and then apply CSS to customize how it looks. When are these Specific Shortcodes Used? In some cases, a website owner would like to list the qualities or information for a specific downloadable item that they are offering to their users. 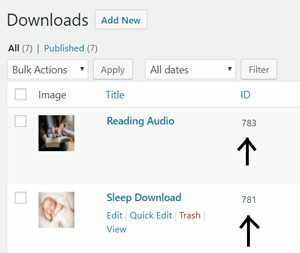 For instance, if I would like to list the title, thumbnail and file size of an item I have available for download I could simply paste three simple shortcodes on my WordPress page beneath a blog I have written about the download. When a website owners needs extensive customization. The details can be wrapped in CSS classes and styled as you please. When a list of details about a download is needed. When a download may change in the future. If you have used these shortcodes, the information will be pulled directly from that download and will show it on the page/post. This means that you will not have to go back and edit each individual page you have listed information about your download on. Create a post/page where you would like to display your downloadable item’s information. Give your post/page a title and choose which information you would like to display. Copy and paste the desired shortcode from the choices below into the WordPress editor. Edit the ‘id’ parameter from ‘123’ to the actual ID of your chosen downloadable item. The “id” parameter refers to the downloadable item’s id and the “download_info” parameter is for the information you wish to show for that item. Now, you can add definition for the “my-custom-download-display”, “my-custom-download-display-name” etc. classes in the CSS file to customize how they look.